I've thoroughly enjoyed living aboard since October. 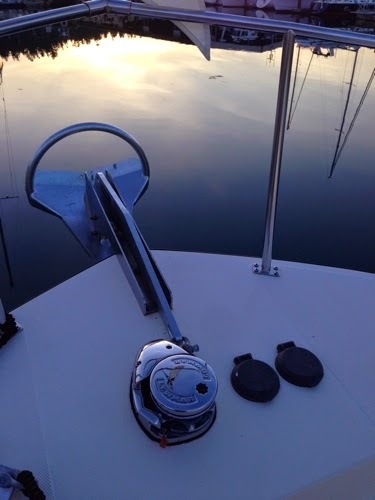 I spent November, December, and the first part of January in Skyline Marina in Anacortes. In the middle of January I took the boat to Seattle and stayed at Elliott Bay Marina until mid-March. I spent the last couple weeks of March cruising all over Puget Sound in order to update the Waggoner Guide. This was the longest trip I'd taken in the boat and was impressed by how comfortable, efficient, and easy to operate it is. That trip brought me back to Anacortes, where I've been working on projects and getting the boat ready for Alaska this summer. Below is a partial list of projects I’ve undertaken to be sure the boat is in tip-top shape. New dinghy. I selected an Achilles HB 315LX and have been very happy so far. It’s fast, stable, and light. I powered it with a Yamaha 9.9 2-stroke that I already had, and with just me in the boat it’s scary fast. Engine service. New belts, new injectors, cleaned and pressure tested the heat exchanger, aftercooler, and gear oil cooler, new coolant. Same service for the genet. Duplex Racor filters. With a single engine, I wanted redundant primary fuel filters. With two Racor 900’s, a clean filter is as easy as twisting a valve. Vacuum gauges on the filter indicate when a change is needed. New ground tackle. A Rocna 20 kg (44lb) anchor replaces the old 44lb claw and 300 feet of 5/16” high-test chain replace the old combination rode. The old ground tackle will be aboard as a spare. The new, heavier ground tackle killed the existing Simpson-Lawrence Sprint 1000 windlass, so I replaced it with a much more robust Lewmar V3. New windlass, anchor, and chain. New dripless shaft seal. The old one was 14 years old and didn’t leak, but with something as critical as a shaft seal, I wanted fresh parts. Spare parts. Extra pumps and electric motors (of all sorts), filters, fluids, etc. Just some of the spare filters aboard. Updated electronics. AIS transceiver, new (second) VHF, laptop with Coastal Explorer, Simrad NSS12 chart plotter. I have a 4G Broadband Radar sitting on my desk, but no time to install it before leaving. Shakedown cruises. I've put about 150 engine hours on the boat throughout the winter. These hours have uncovered several issues, most small but some large (i.e. dead windlass). I’ve undertaken countless other, smaller projects, but these should give readers an idea of how much goes in to setting up a boat for cruising the Inside Passage. Hopefully they’ll all pay off with relatively trouble free cruising this summer! After one more run to Costco, Target, Safeway, and West Marine I should be ready to go. On Saturday I'll move the boat over to Cap Sante Marina and fuel up. Departure is set for Sunday morning. This summer I'll be leading a group of boats to Ketchikan. We expect to arrive around June 20th. After that I'll cruise Alaska for about a month (independently) before turning south from Juneau around July 20th.